Where the crew might have started out a little bit unsure about this level, we ended up with a deep appreciation for its usefulness. It's the whole package from leveling and screeding to the ergonomics and build quality that seals the deal. Although some tools in the masonry world have become fancier, we still use plenty of the more rudimentary tools. It’s not surprising that trowels, floats, and screeds don’t receive the lion’s share of manufacturers’ R&D budgets. It makes sense – after all, what kind of innovation could really happen with any of these items, right? Well, Milwaukee has a bright idea for one of our often-overlooked tools. Masons need straight screeds and levels since the surfaces they pour need to be level or sometimes slightly graded. Rather than pressing your level to the top of your screed, doesn’t it make more sense to combine the screed and the level? Evidently, Milwaukee thinks that it does, and so they’ve released the Milwaukee Redstick Concrete Level. Incidentally, I have it in my hands right now, because presently, a cement pump is pushing a ton of wet concrete toward a new deck and stair project I’m working on. Let’s dive in! The Milwaukee Redstick Concrete Level features an all-metal core and three high-impact acrylic SharpSite Vials. Two plumb vials bookend the center pitch level vial with 1/8- and 1/4-inch gradient lines. The bubbles and lines look really clear and bright, even when outside in the middle of the day. Of course, that’s what I expect from Milwaukee, especially considering their ownership of Empire Level, a company who knows a good bit about high-vis vials. On the business end, a 2″ wide magnesium base makes up the screed and darby. Milwaukee has squared one edge off, making it perfect for screeding. If you flip the level around, you’ll notice that this edge has some softer contouring, making it a better choice for darbying applications. It’s a cool little detail that might not jump out at you right away. 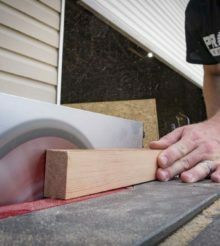 If you look down the length of the Milwaukee Redstick 48-Inch Concrete Level, you’ll notice what the company calls a “keyhole design.” A rounded top and a narrower, square base give this level a unique shape. Milwaukee has designed that rounded top to give the user a more secure and comfortable grip along the whole tool. I’ve got to say that it works really well. Apart from the multifunctionality of this tool, I find the ergonomics to be an excellent selling point for this level. Concrete is a dirty, crusty business, and it can be easy to miss some things upon cleanup. The chances are good that at some point, concrete mix will inevitably dry on the level’s housing. Have no fear, because Milwaukee designed the RedStick Concrete Level to wash clean, even from dried concrete. The PTR guys saw a demonstration of this feature at the 2017 Milwaukee New Product Symposium. The Milwaukee RedStick Concrete Level had 48-hour-old, dried concrete covering it. With a little bit of water and a brush, the level looked as good as new. We had a similar experience with the cleaning (although, because we care about our tools, we didn’t test it with dried concrete). After we finished the job, we ran the level under a hose, and it washed off as easily as advertised. As it turns out, the magnesium, plastic, and thermoplastic elastomer (TPE) that Milwaukee uses in this level’s construction make cleanup simple! I got a little nervous when I first showed my crew the Milwaukee Redstick Concrete Level. The guys were suspicious that a 48″ screed would be useful at all, and they definitely let me know about it! A lot of it was good-natured ribbing, but they had a point about the length. To be fair, while I’m using the 48″ model, Milwaukee does have a 72″, which is probably the better bet for most masons. However, you can make the argument to have both sizes. In our neck of the woods, a screed typically runs 8-feet long, but a 6-footer can be useful in tighter spaces. Pro Tip: The reservations the guys have about the 4′ level arise from the fact that regulation sidewalks are 4′ wide. When you move one end of the screed toward you to remove excess concrete, the screed falls short and can’t span the entire walk. That means that one end or the other will fall off the form and into the mud. That’s why we normally only carry 8′ or 6′ screeds. Since we were doing some concrete fill-in work that spanned less than 4′, it seemed like my guys were crying for nothing. They readily admitted that the 48″ Milwaukee RedStick Concrete Level would be clutch in quite a few different applications. This size is perfect for floating skim coat, tile work, and floating floors that need to slope toward a drain. I dig the innovative spirit behind the Milwaukee Redstick Concrete Level. However, where the crew might have started out a little bit unsure about this level, we ended up with a deep appreciation for its usefulness. It’s the whole package from leveling and screeding to the ergonomics and build quality that seals the deal. The only hesitation is the price. At $99 (24″), $149 (48″), 0r $219 (72″), the Milwaukee Redstick Concrete Level won’t be the cheapest level you’ll come across. You’re definitely going to pay a premium over a standard magnesium screed. But if you’re serious about concrete or tile work, it’s a convenient way to cover a lot of your bases in one tool and it’s earned its place on my crew.